1. 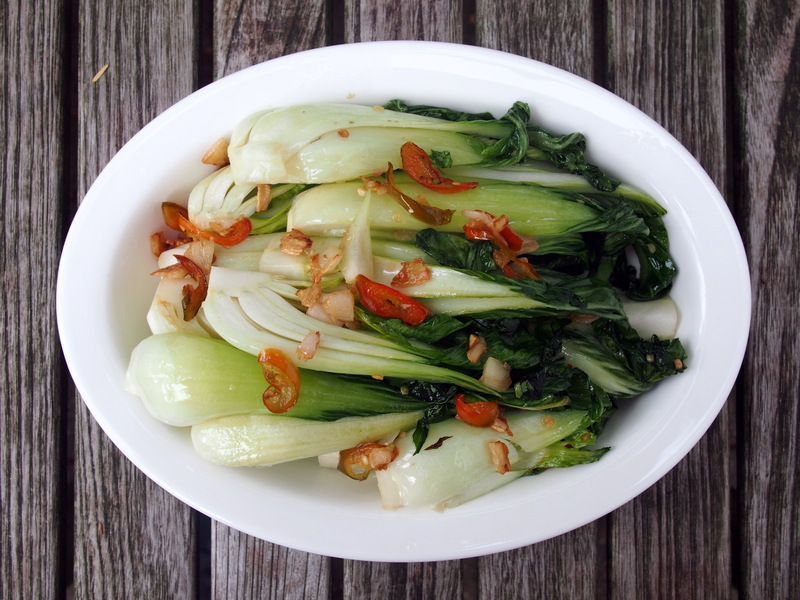 Remove any bruised or withered outer leaves from the bok choy . Trim 1/8 inch from the bottom of each bok choy, then cut each head into quarters (if the bok choy are very small, halve them or, if they are tiny, leave them whole). Wash the bok choy in several changes of cold water and dry them in a colander or salad spinner until they are dry to the touch. 2. In a wok, 12 inch skillet, Dutch oven or soup pot (any pot large and wide enough to comfortably hold the greens will do), heat the oil over medium high heat. When its hot but not smoking – it should appear shimmery – add the garlic, salt and chiles. Saute, stirring, until the garlic just begins to lose its rawness, about 1 minute. (Try not to let the garlic turn golden or brown, which would give this dish an inappropriate roasted taste). 3. Add the greens. 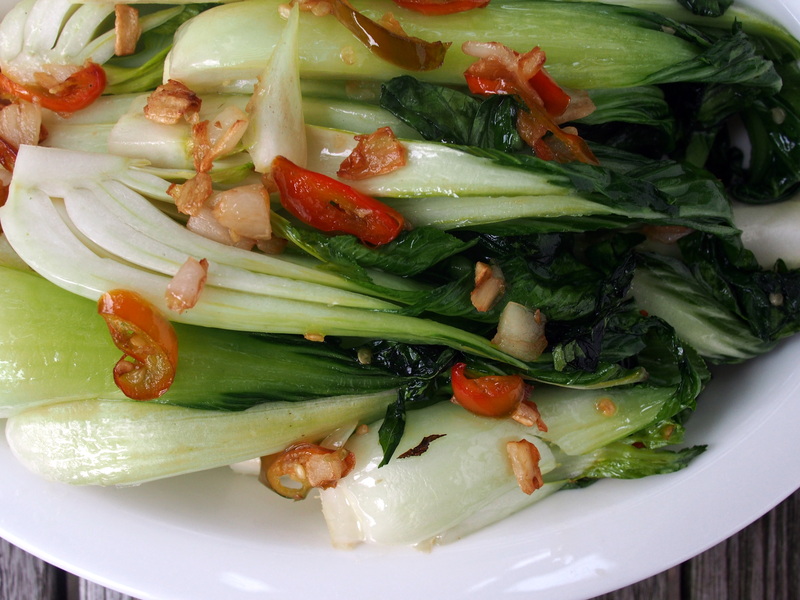 Raise the heat slightly and immediately begin to vigorously stir-fry the greens around the pot. Continue to vigorously stir-fry the greens until they just begin to go limp but the leaves remain a spring green color and the stems are still crunchy-crisp, about 3 minutes. Taste for salt, adding only a pinch more if necessary (a little salt goes a long way with greens). 4. Transfer greens to a large serving platter and serve promptly. Be careful not to pile the greens in a small bowl. They will continue to cook for several minutes after they’re removed from the heat, and crowding them in a small bowl may cause them to overcook and become mushy. NOTE: Holland chiles (also called Dutch or finger chiles) are the primary hot pepper used in Indonesian cooking. They are ruby red in color and glossy skinned, with narrow, fingerlike bodies that end in sharp points. They’re about four inches long (sometimes longer, but rarely shorter) and a half inch in diameter at their thickest point. They have juicy, sweet-tasting flesh and tight, waxy skin that keeps them from spoiling quickly. Holland chiles vary from mildly hot to scorching, but they lose much of their pungency when cooked. They-re available year-round in North America, generally imported from the Netherlands.